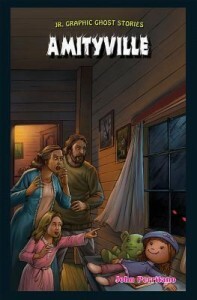 A parent in Knightdale, North Carolina is calling for the removal of Amityville: Jr. Graphic Ghost Stories from all Wake County schools after her first grade son checked the book out of the Lake Myra Elementary School library earlier this week. Parent Kay Walker feels that the graphic novel, which retells the infamous story of the Amityville horror house in Long Island, New York, and the paranormal events that occurred there in the early 1970s, is inappropriate and should not be accessible to students of any age. D. The challenged material will continue to be used until the consideration process is completed; however, the use of the material(s) for that particular student shall be suspended, if requested by the parent(s). This policy and appropriately handling challenged books shouldn’t be news to Wake County School district. In 2014, Toni Morrison’s The Bluest Eye was banned from East Wake High School’s curriculum after a review committee decided that the book had less literary value in how it portrayed issues of sexual assault and violence. Although it is unclear if the policy has been violated in the case of Amityville, without a doubt the answer to handling materials one person might find personally upsetting isn’t to have it taken away from all students.